Lancaster, Pa. — The Precast/Prestressed Concrete Institute (PCI) recently announced the winners of their 2018 Design Awards. The program, in its 55th year, recognized 21 projects with awards of excellence in design. More than 100 project entries from across the U.S. were submitted for award consideration. 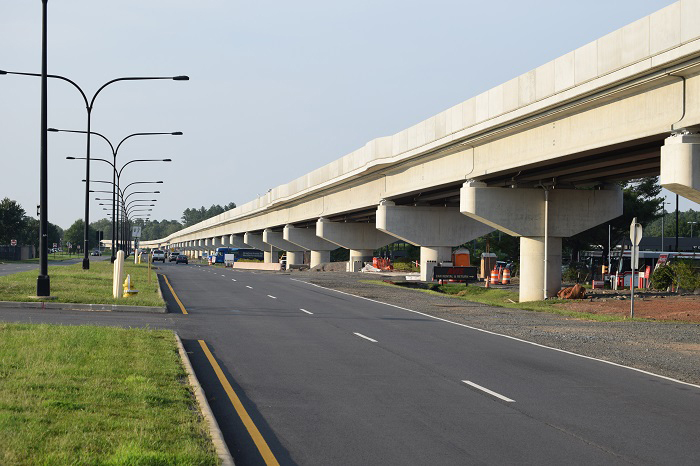 The Aerial Guideway project for the Dulles Corridor Metrorail received the 2018 PCI Design Award for Transportation: Best Non-Highway Bridge. Coastal Precast Systems of Chesapeake, Va., a PCI Mid-Atlantic member, was the precast concrete producer for the project. The project owner is the Metropolitan Washington Airports Authority (MWAA). When completed, the Dulles Corridor Metrorail Phase 2 will (to the east) connect Washington Dulles International Airport to Washington, D.C., and Loudoun County, Va. (to the west) with numerous stops along the way. The project includes a station at Dulles, and an aerial guideway that will carry passengers above the busy airport. The aerial guideway required a thoughtful design strategy, says Gregory Shafer, bridge technical manager for Parsons, in Baltimore. In addition to filling a gap in the transportation network, the guideway needed to complement the landscape of a historically significant transportation hub. It also had to be delivered at a reasonable price. The design-build project had a $1.2 billion bid value, with low bids separated by just 1.2 percent, making it very cost-competitive, Parsons said. Precast concrete offered a high-durability and low-maintenance solution, which was critical to meeting the 100-year service life requirements. The use of precast concrete also minimized impacts on nearby roads and wetlands and delivered a high-quality product at a lower cost relative to the alternatives. According to Parsons, the fully prestressed, factory-produced precast concrete elements met serviceability requirements and fit well within the historic airport architecture. The ability to quickly mobilize and erect the precast concrete girders was another advantage of precast concrete, as it minimized impacts on airport traffic and operations. Elements of the bridge required tight 800-foot-radius curves, along with higher live loads and overall requirements for rider comfort. The use of prestressed concrete girders in a chorded configuration worked well with the spans of up to 150 feet on the curved alignment. The girders incorporated draped prestressing strands with flared spacing at the ends. Florida wide-flange I-beams (or FIB) sections with four different depths were used to minimize the structure depth and deliver an efficient structure. Additional details and photos for this award-winning project are available at https://www.pci.org/PCI/Project_Resources/Project_Profile/Project_Profile_Details.aspx?ID=214956.